Winsor Newton Prestretched Artist Canvas Standard Edge 3/4 inch wide. Winsor Newton. 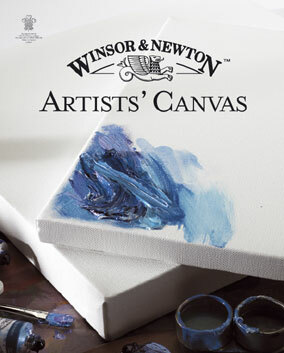 the premiere name in artist paints, now offers a stretched artist canvas to put their paint on! The best thing about this prestretched artist canvas is that it is stapled on the back, which is nice is you are not going to frame the painting, it gives a more pleasent finish and a creative option to the artist . This is becoming more and more the trend. In quality it is very good . It uses 8 oz. canvas, whereas many prestretched canvas's are 7 oz. Winsor Newton is a British Company that has made artist paints for over 140 years.The canvas comes in two widths, 3/4 inchand 1.5 inch. Triple-coated with acid-free sizing and two coats of highly pigmented acrylic primer formulated by Winsor Newton. Balanced absorbency and tooth prevents sinking of oil colors and improves adhesion. Professional frame construction with kiln-dried, beveled stretcher bars. Stretched by hand for best tension and tailored corners with ample canvas on the back for restretching. Individually shrink-wrapped.